This wine is from California's Temecula Valley appellation, and the Musque Clone Sauvignon Blanc that was used to make this particular wine was sourced from the Carter Estate Vineyard. I have always really enjoyed when wineries chose to use the Musque clones because I believe it gives the wine such an amazing bouquet. If I'm not mistaken I think Merry Edwards uses Musque, and if anyone has tried her S.B. 's then they'd know the quality that can be produced with this particular grape in California. On the nose I immediately get quite a rush of citrus peel and fresh cut grass. These aromas are also accompanied by some really distinct gooseberry and kiwi notes. 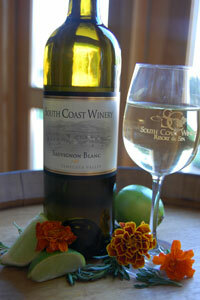 It's a very vibrant and quite well-defined bouquet that is unmistakably Sauvignon Blanc. On the palate the wine is quite round in texture and speaks directly to the use of this particular Musque clone. I get flavors of tangerine, stone fruits, kiwi, and some subtle mineral notes. The wine definitely carries a touch of residual sugar, but finishes with enough acid to make the wine considerably balanced.